At SeaWorld's Loro Parque, Orca Morgan can be seen apparently slamming headfirst into a locked gate over and over again. A DISTURBING VIDEO taken at SeaWorld partner Loro Parque, a marine park in Spain’s Canary Islands, highlights the extreme stress that captive orcas endure when locked behind bars in tiny tanks barely larger than their own bodies. An orca believed to be Morgan, whose sad story has led to international efforts to free her, can be seen apparently slamming headfirst into a locked gate over and over again. You don’t need to be an animal behavior specialist to realize that she is clearly distressed. SeaWorld loaned four orcas to Loro Parque as part of its now-defunct breeding program. Those orcas now live alongside Morgan, who was taken from her ocean home off the coast of Norway under the guise of rehabilitation. She was slated to be returned to the wild after a short period but was instead shipped to Loro Parque and ended up in SeaWorld’s possession, despite widespread objection. 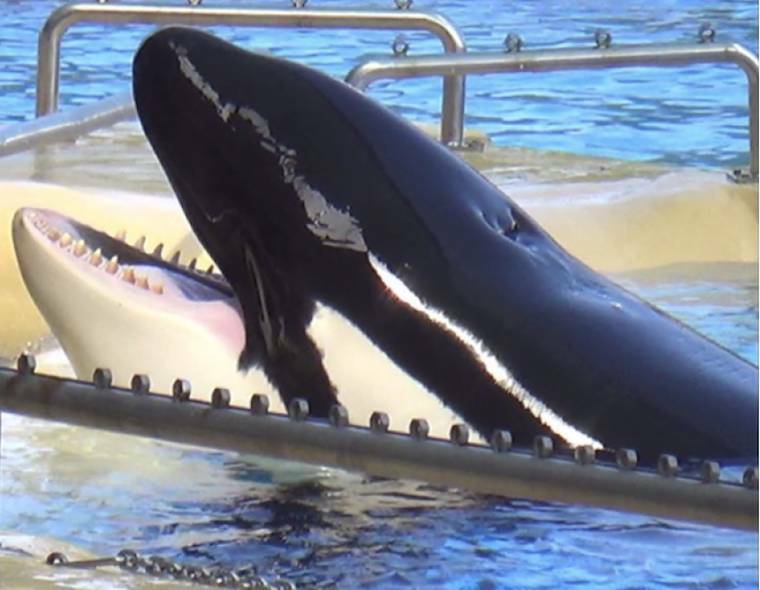 Observers who spent lengthy periods of time observing Morgan’s life at Loro Parque found that she was attacked by the other orcas, on average, more than once EVERY HOUR. She has sustained more than 300 documented puncture and bite wounds, all inflicted by her cellmates. During four days of observation, 91 incidents of orca aggression were witnessed at Loro Parque. All of them involved Morgan. All the orcas owned by SeaWorld will live out their days in these prison cells, not just Morgan. Tiny tanks will never be an adequate substitute for the open ocean. Time and more videos will only go to show that SeaWorld’s practices are cruel and that its business model is inappropriate in this day and age. Families don’t want to see intelligent, powerful, beautiful animals like Morgan held against their will.